The star which shows the direction of the north in the sky is called Polaris. This is not the concrete star because for ages Polaris become different stars. So the Polaris is a symbol of the stable direction. This star was always helpful to find the position and to mark a destination of the journey. We will help you to gain this all with pleasure - we invite warmly to the seaside-harbour - hotel POLARIS. 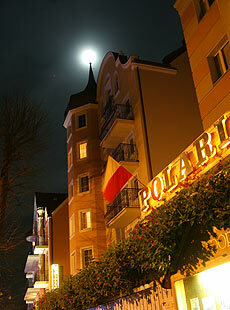 Hotel Polaris is situated in sanatorial part of Swinoujscie, about 200 metres from the beach. Hotel Polaris at Słowackiego 33 street has rooms with different standards of the equipment. Polaris II – higher standard (bigger rooms after the repair). We have also the typical kurhotel with treatments named Polaris III at Żeromskiego 26 street, where we have sanatorial services on the high level. The kurhotel Polaris III is the outermost north-west sanatorium in Poland. From balconies one can hear the noise of Baltic Sea. It is situated at the Promenade, rimmed with luxuriance. 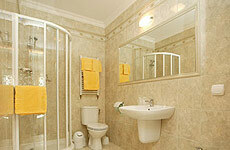 All hotel rooms have their own comfortable bathroom. Each room is equipped with radio, TV-Sat with the satelite television and telephone. There are available rooms with balcony. Rooms have cable or WLAN Internet. We invite to view pictures of the rooms: » picture gallery. At our guests disposal is: the restaurant "Ambassador", the bar and covered swimming pool. Hotel Polaris has his own covered swimming pool!. 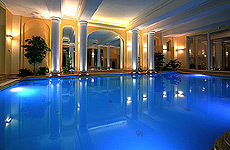 use jacuzzi, steam sauna, covered swimming-pool or massages and other physiotherapy treatments. Near by the hotel are racket courts - 150m. We specialize in sanatorial stays, therefor both, hotel Polaris and kurhotel Polaris III have their own modern threatment base. the relax holiday at the seaside - weekly holiday.